Continental Environmental Services Ltd., has had HIscox insurance in place to substantiate the UKAS accreditation of the works we undertake. The works we undertake must be paid for in order for insurance to cover the works undertaken as part of the procurement, implementation and reporting of the works. 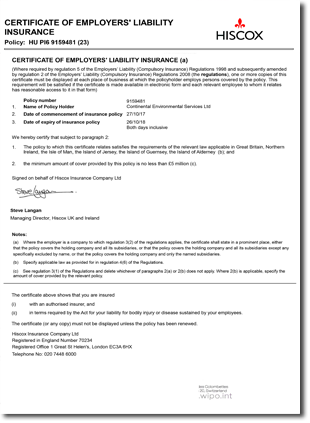 The listed insurance certificate can be independently verified with Hiscox.